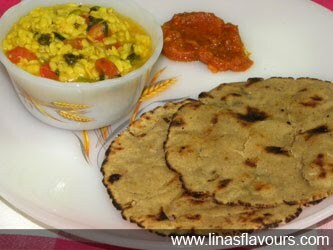 Take jowar flour, wheat flour, garlic paste, pepper, salt and mix it well. Add oil and knead dough. Make small balls and roll the rotis of about 4-5 inch diameter. Take tawa and roast roti on both the sides on low flame. Apply ghee. Serve it hot with garlic chutney and peas-urad dal.